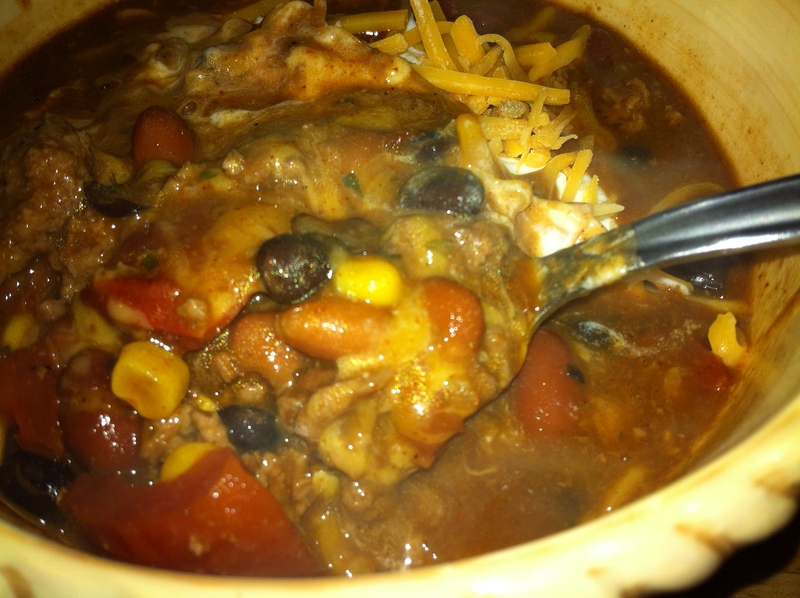 It’s true, there are tons of recipes for taco soup … but I swear mine is the yummiest :). Actually, I’m sure there are several delicious recipes for this soup, but I am just partial to mine. It’s cheap, easy, quick, filling, provides for lots of leftovers, and is always a hit. 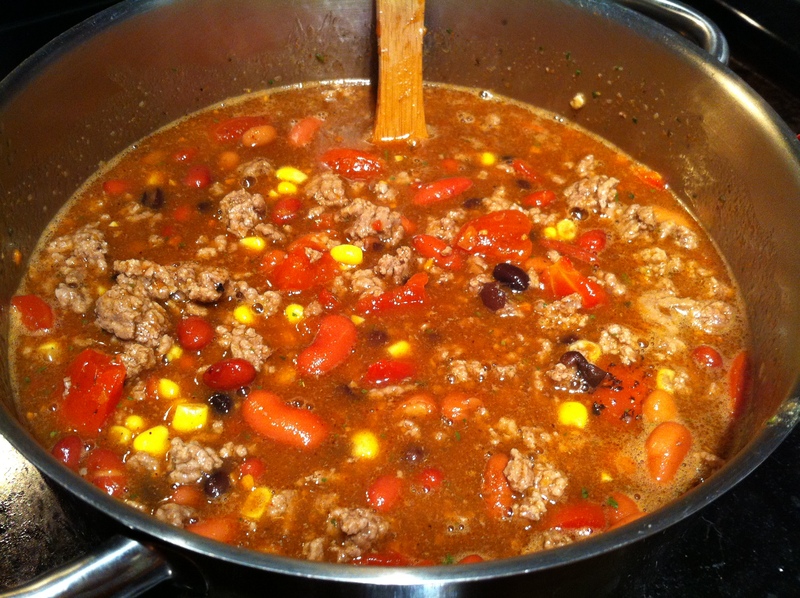 If you haven’t tried taco soup before, think chilli on crack with more beans. It’s perfect when you have a houseful of guests, don’t feel like spending much time in the kitchen, or want to curl up on a cold winter’s night with a bowl of warm soup. You can throw the ingredients in a crock pot and turn them on low while at work for a more flavorful soup, or just heat it on the stove for an hour before dinner time. Either way, you’ll have a delicious meal for under $15. The recipe calls for a variety of canned beans (the ones I prefer are listed and pictured below, but you can definitely trade some out for your favorite beans), a can of corn, a large can of stewed tomatoes, two packs of taco seasoning, a packet of Hidden Valley Ranch Mix, and one pound of ground beef. 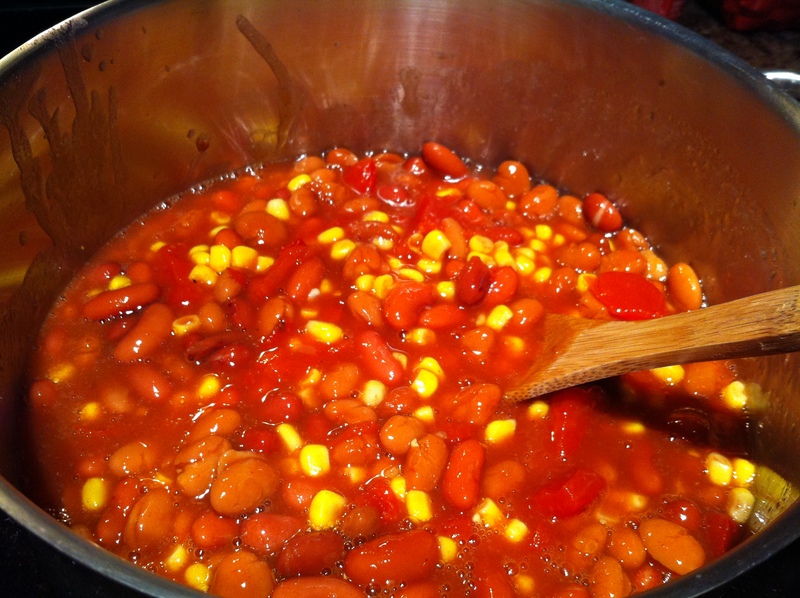 Once the meat is cooked, add it to the pot of beans and stir well. Next, add the second pack of taco seasoning and ranch mix. If you prefer it a littler “soupier” add water half a cup at a time until it reaches your desired consistency. I prefer it just the way it is. Stir well, cover, and let sit on low-medium heat for at least thirty minutes, longer for more flavor, stirring occasionally. 1. Brown the meat on the stove. Drain, then add one packet of taco seasoning as directed on the package. 4. Stir well, cover, and let sit on low-medium heat for at least thirty minutes, longer for more flavor, stirring occasionally. 5. Serve warm and top with sour cream and shredded Mexican-blend cheese if desired. * To cook in a crock pot, prepare meat and soup as directed above. Let cook for 4-7 hours in crock pot on low heat. * Soup freezes well and lasts 3-4 days in the refrigerator.